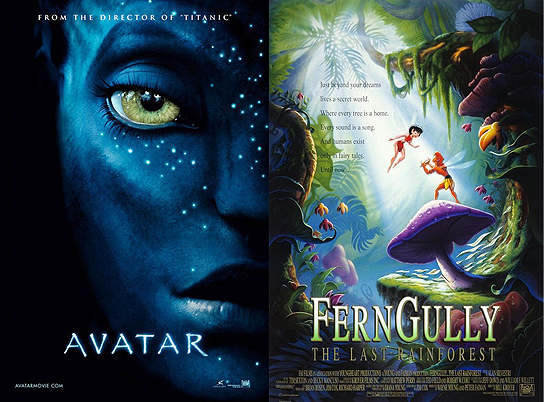 “Avatar” vs. “FernGully: The Last Rainforest” – A Case of Plagiarism? Although there has been a number of comparisons done recently between ‘Avatar’ (2009) and ‘FernGully’ (1992) (also ‘Pocahontas’ (1995) and ‘Dances with Wolves’ (1990)), I, nevertheless, have decided to take my own turn on the topic and ascertain the similarities between the two movies. In this piece, I will provide some evidence that demonstrate that ‘Avatar’ and ‘FernGully’ are so similar – both in plot lines and style (more so than many other films/stories), that, in my opinion, it was nearly impossible (for James Cameron) not to have in mind ‘FernGully’ when writing ‘Avatar’.